Our mission started September, 2002, exactly one year after tragic September 11th. Since that time we have made 29 separate mission trips over the past ten years and have operated on 386 patients with excellent results. What started as a local endeavor of doctors and nurses from Southwest Florida, has grown into a national project attracting doctors, nurses and technicians from all over the country. Over 200 different volunteers have come on our mission trips. Over 275 heart valves have been implanted in the 386 patients. 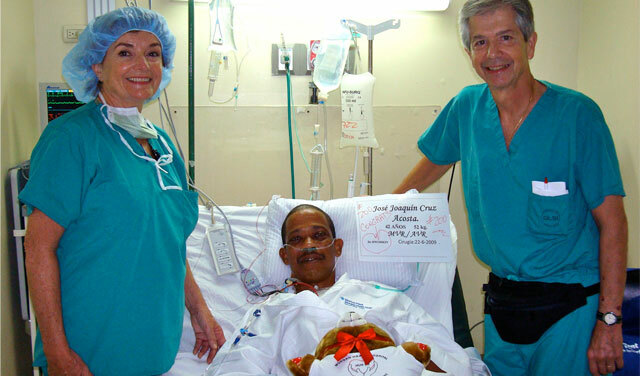 This has been accomplished with the help of donations from medical corporations and private individuals. Although retired from active practice since 2008, we organize and partake in every mission trip. Our Heart To Heart Mission continues to positively impact people of Santiago, Dominican Republic through our continued leadership of the pro bono mission. At a stage in life when many are content to pursue personal interests, we are indeed fortunate that we are able to devote time and talents to give back to those indigent patients in need. ©2019 Heart To Heart Mission Powered by PA Web Design Company, Zen Design Firm.